Not All of Them Have to do With Fireworks! 1. Stay home. What better way to celebrate the Fourth of July than by staying home and celebrating true independence and the right to do as you wish? Polls and studies consistently show that Americans are overworked, laboring at the office more than people in other countries and more than we should. We suggest you take the day to relax and truly enjoy life with your loved ones. 2. Whip up some Fourth of July recipes. You could always go with traditional food fare like hot dogs and hamburgers with a side of potato salad. You could also throw in a colorful concoction like this flag cake from the Food Network or check out their top Fourth of July recipes here. (Or get take-out if cooking stresses you out and you prefer to stick solely with idea No. 1.) Don't forget to order your cupcakes or cake from Ontario Bakery. 3. Go to a baseball game. What could be more American than going to a good old fashioned baseball game. This is one of the most traditional American activities. You may be lucky enough to have one nearby that also includes post-game fireworks. 4. Take the time to infuse your home with some red-white-and-blue decor. It can be as simple as going over to your nearest dollar store for a few choice wares, Target or discount stores for more upscale decor, or the crafts store for some supplies to craft your own. There are many places online where you can search for DIY inspiration, including Pinterest and blogs. 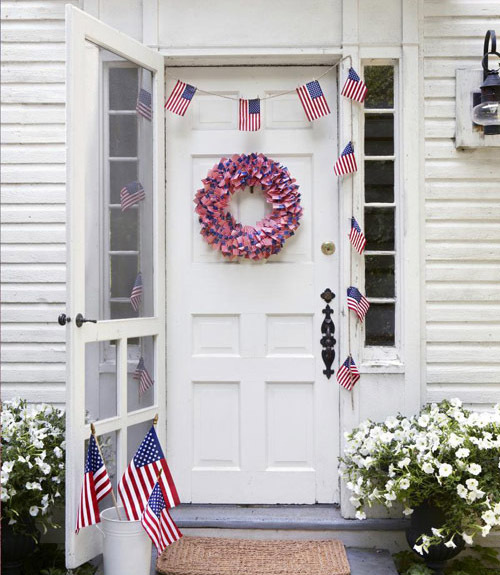 We found some easy ideas on Good Housekeeping, http://www.goodhousekeeping.com/holidays/4th-july-ideas/red-white-and-blue-decorations#slide-1which featured some simple projects, some which could likely be done with items you already have on hand. 5. Throw your own Fourth of July bash. Plan ahead and host a traditional Fourth of July barbecue for your family, friends and neighbors. It is almost a requirement that you do this if you are fortunate enough to have front-row seats to your local fireworks show. 6. Head for the beach. Sure, the beaches are packed on this holiday, but the beaches are always packed when the weather is good, as it often is in Southern California. 7. Hit the road or hop on a plane. Whether you decide to stay within driving distance or to hop on a plane, keep in mind that Fourth of July is traditionally the busiest travel day in the summer and plan accordingly. (Thanksgiving is the busiest overall). 8. Check out your local parade. You can find more bells and whistles at parades hosted by larger cities, but the smaller, local parade is a great way to show your support for the local community groups and businesses who usually stage the annual parade in your local community. 9. Avoid traffic jams by staying home and watching one of several TV show marathons that are usually offered on this holiday. Past Fourth of July marathons have included shows such as Twilight Zone, Gidget, Storage Wars, Star Trek - The Next Generation and America’s Funniest Home Videos. 10. Fireworks. What would Fourth of July be without fireworks? After you’ve done all or some of the above, the best way to ponder the many freedoms we have thanks to the Declaration of Independence is by enjoying a good fireworks show.